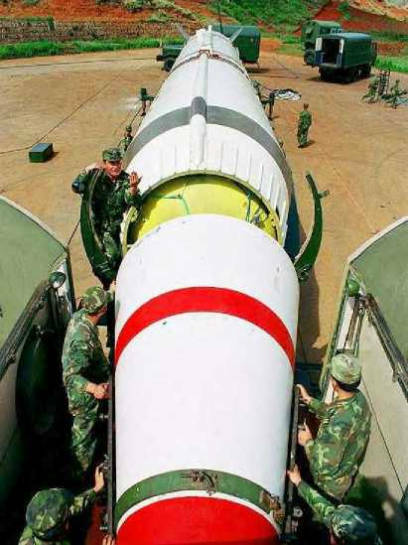 "The Dongfeng 3 (DF-3) medium-range missile is completely independent of China's self-developed liquid-ground medium-range missiles: Missile full length about 22.47m, maximum diameter of 2.25m, a takeoff weight of 65 t, the propellant can be stored as unsymmetrical dimethyl hydrazine / nitric acid, engine ground thrust 104 tonnes (four single parallel connection), the control system for the location SINS guidance, warhead is a 3 million tons TNT equivalent of thermonuclear warheads". 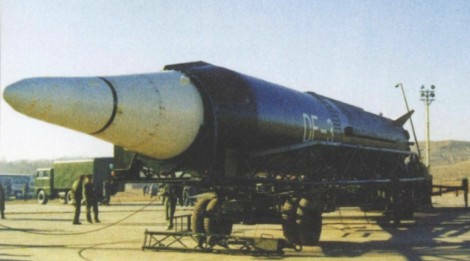 China deployed a small number of DF-3 missiles beginning in late 1971. 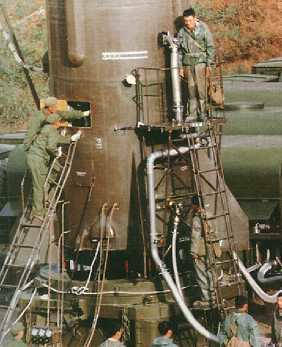 Early firings of the DF-3 were from Shuang Chengtzu during 1966 and then moved to Wuchai for longer-range testing in 1968. 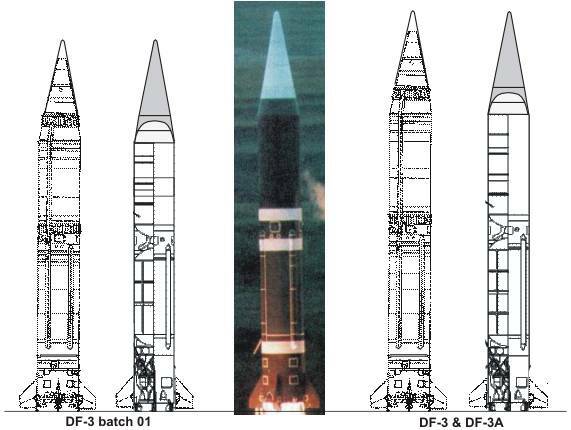 There are at least two versions of the DF-3. 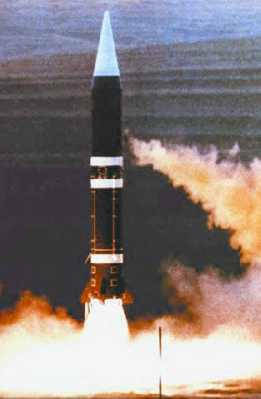 The initial model had a range of about 2,650 kilometers and carried a single nuclear warhead weighing 2,150 kilograms. 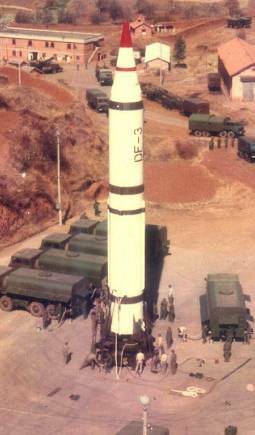 During 1983 and 1984 a range extension program on the DF-3 increased the range of the DF-3A to 2,780 km. Of a total of some 100 DF-3 missiles, about 80 are of the improved DF-3A version which was deployed beginning in 1988. 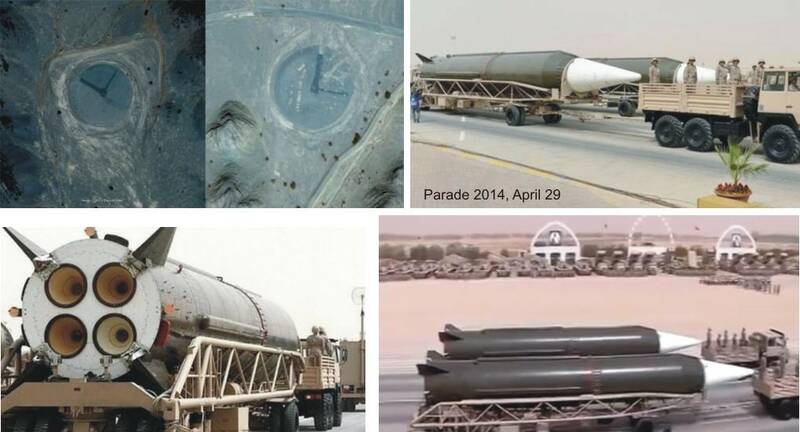 In 1987 China sold several dozen outmoded DF-3 missiles to Saudi Arabia, without their nuclear warheads. 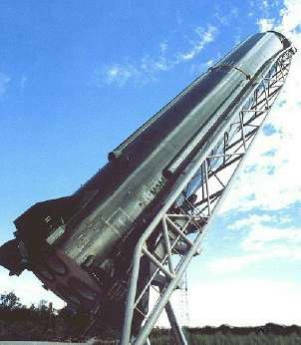 The DF-3 provided the first stage for the follow-on two-stage DF-4 missile. 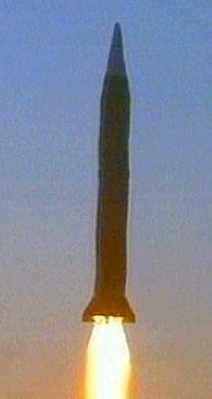 It also provided the first stage of China's first space launch vehicle CZ-1. 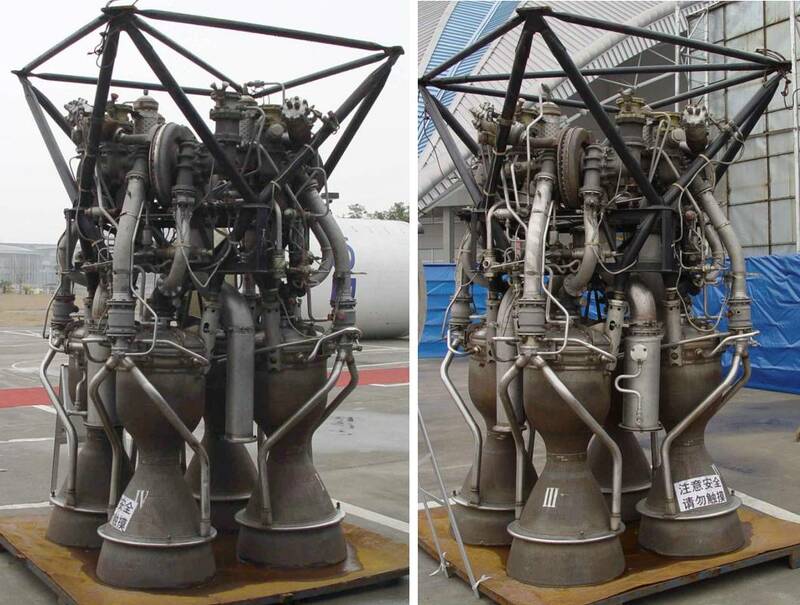 This is the YF-2 engine with four turbopumps ! 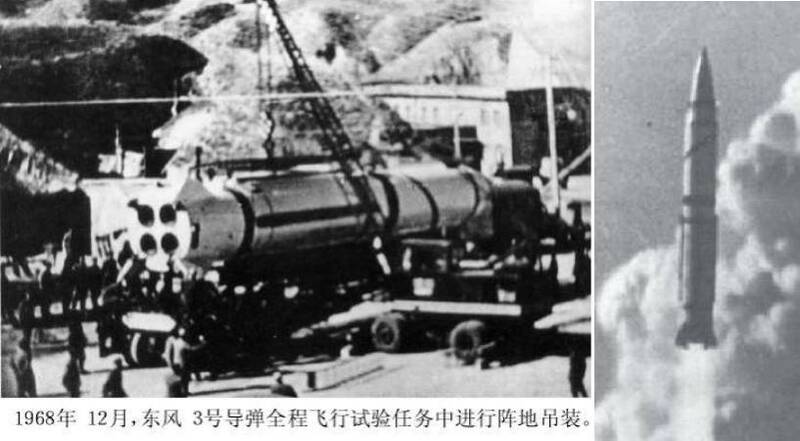 The "Dongfeng 1" (later renamed to DF-3) exploration and evaluation work program beginning in 1958. Gradually began to discuss the various options. The first consideration is what kind of propellant. Some advocate the use of liquid oxygen and kerosene, and some advocate the use of red fuming nitric acid and kerosene, as well as recommendations with red fuming nitric acid and UDMH. After analysis and discussion, consider using kerosene as fuel is difficult to solve the problem of high frequency combustion instability engines; while toxic hydrazine as fuel and too much. The third design to collect data from the Ministry, discusses ways to new engine technology, and the design and research in conjunction with relevant departments of kerosene, and mixed amines such as hydrazine fuel to do thorough research and comparison. Also in the study of the overall program, also encountered the projectile diameter in the end how much is a good question. 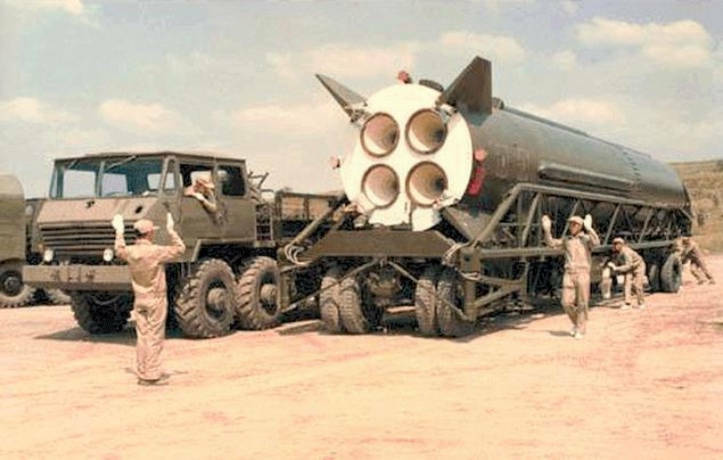 Some advocates continue to follow the DF-2 (similar Soviet R-5) in diameter. Some advocate the use of 2.5 m in diameter. Advantages and disadvantages, in-depth research and analysis to be done. Control system is also proposed various options envisaged. In June 1960, the first in the overall design of the study, based on a preliminary analysis, each subsystem "Dongfeng 1" proposed design of technical requirements. Engine (codenamed "5D10") single thrust of 20 tons, four machines in parallel. Propellant mixture of nitric acid and amine. Addition: The DF-1 idea originated from Soviet missile R-12. Similar to the R-12, the DF-1 used storable liquid propellants (TG-02/AK-20) for improved readiness and had a cluster of four engines with a total lift-off thrust of 64 tonnes. This idea was not followed. 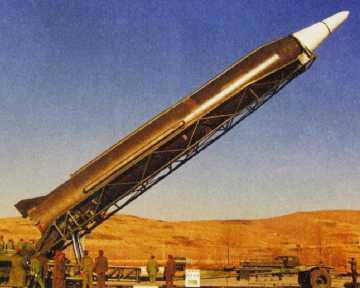 Originally, the DF-1 was planned for completion before the DF-2. 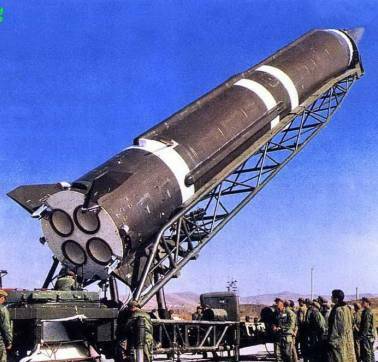 In 1964, the Central Military Commission redefined the different and since 1960 developed DF-1 program and gave the new designation DF-3. 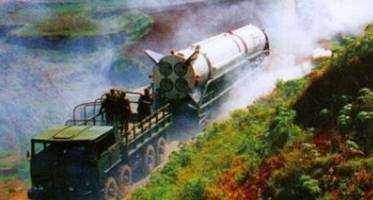 The DF-3 have four engines in a cluster providing 96-tonne lift-off thrust and using UDMH/AK-27 propellants. 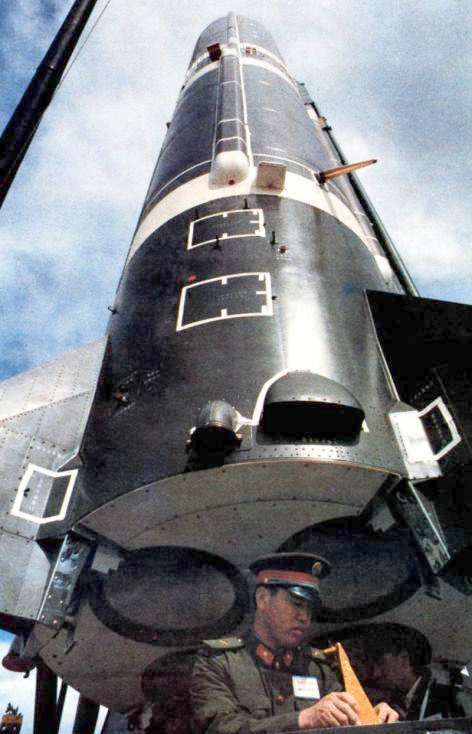 In August 1964, the Fifth Academy scheduled the DF-3 flight tests to start. The propulsion. The 5D10 engine developed individual progress. 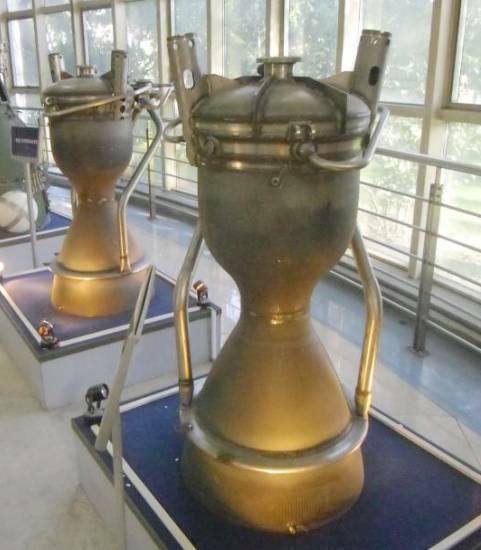 After April 1960, to determine the use of red fuming nitric acid and mixed amine as 5D10 engine propellant, began the research and design work. 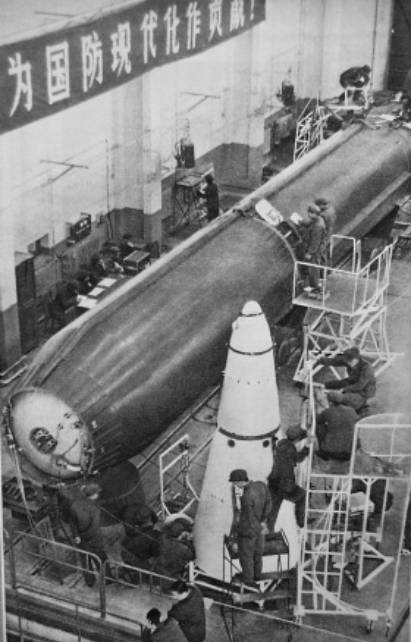 By the end of 1962 to the first half of 1963 have built a hydraulic liquid rocket engine test chamber, the test chamber and the turbopump medium heat test chamber, the gas generator to solve a series of low-frequency combustion instability technical problems and create the necessary conditions, but also for the whole engine system test and create the conditions. 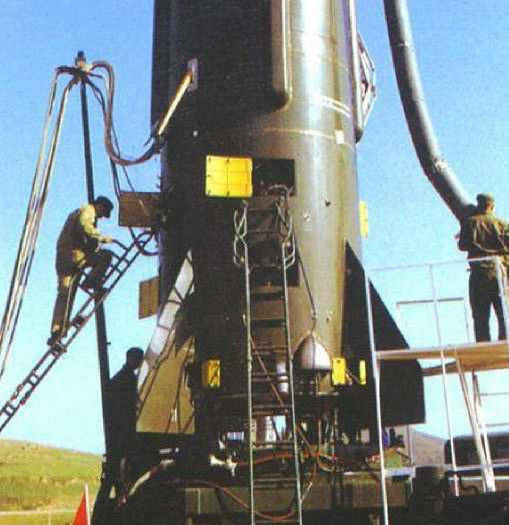 November 1964 built a test bed. To find out instead of using the mixed amine UDMH problems brought decided to use 5D10 engine tests. 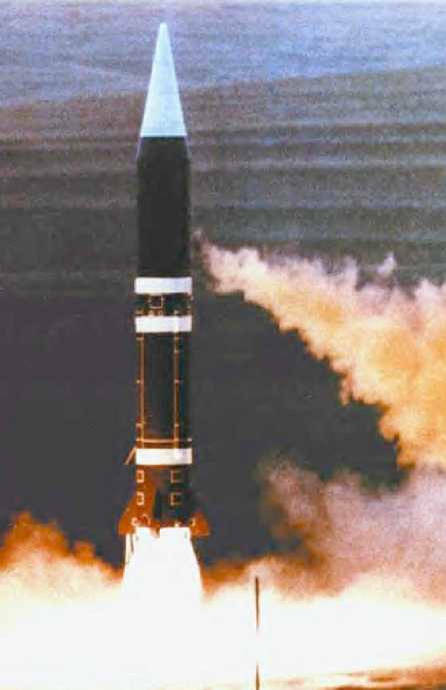 March 1965, conducted the first trial heat, combustion instability problem occurred shortly after the start.This is the first hurdle after the official launch of the development of medium-range missile engine encountered. Using five different "liquid partition" the head of the program, tests were unsuccessful. This suggests that "liquid partition" scheme to suppress high frequency oscillation little effect UDMH and nitric acid produced by combustion must find another way. 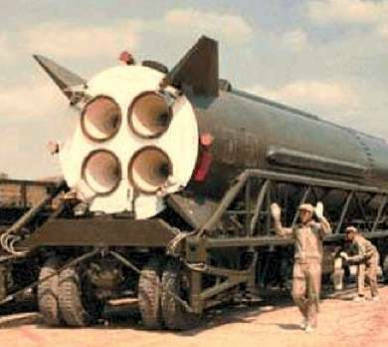 From March 1965 to start within 11 months, a variety of programs designed for 30, 80 carried out several tests, including the failure of successive 17 times. Structural design and theory work closely with researchers, weaknesses, to workshops, laboratories with the technology staff, and workers together to test repeated discussions, testing, brainstorming, proposed a "liquid partition" and "bulkhead partition" of the new combination regimen, After a hot commissioning assessment, indicating that this program is effective, so far, the high-frequency combustion instability of major breakthroughs in key technologies eventually, for the rapid development of a liquid engine technology opens the way. 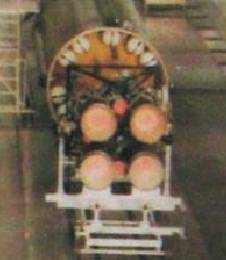 With this program engine codenamed "YF-1", that is, single engine missiles. 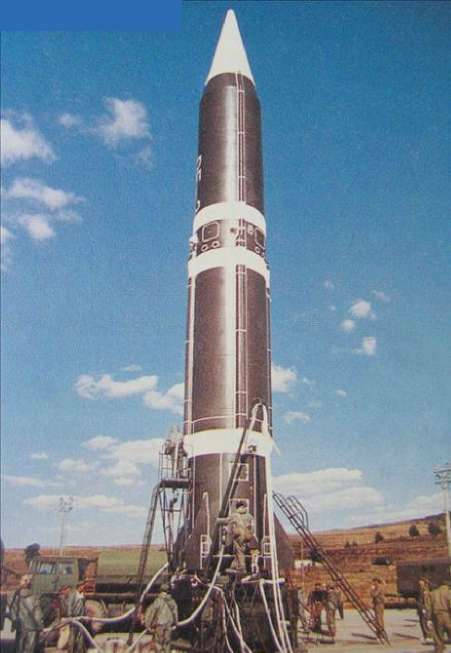 July 1965, has been short-and long-range four-parallel test, the engine according to a predetermined program starts, the main stage work, transfer of class and off, not only to coordinate the work of the four extensions, and stable performance, indicating feasible. 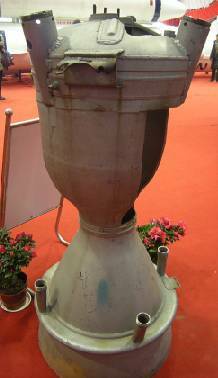 Engine thrust chamber head injection system is composed of over 2000 stainless steel nozzle components. Small nozzle size, precision, finish, shape and position tolerances and flow test accuracy requirements are high. The airframe. 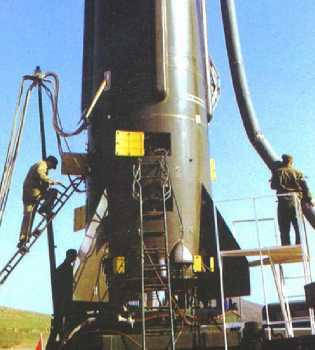 After repeated tests to determine the projectile diameter of 2.25 m; propellant tank with a ribbed reinforced mesh structure of high-strength weldable aluminum alloy corrosion resistance and chemical milling, so that the weight of the tank to reduce medium-range missiles of 25% - 30%; sensitive alloys with medium-range missiles on the cylinder, thereby significantly reducing the weight of the structure. 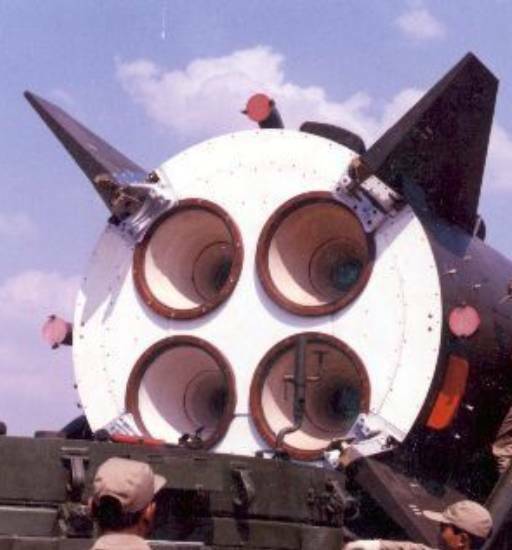 A missile with a titanium alloy cylinders instead of cylinders, we can reduce the structural weight of over 100 kg; separation mechanism and missile warheads for the first time with a shear bolt and gunpowder explosion actuators, simple and reliable structure , the operation is very convenient, greatly reducing the head, body docking connection time. 1963, August. 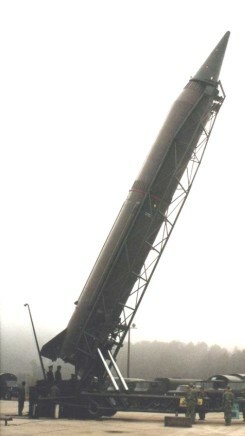 The "DF-1" parallel with four liquid rocket engine as the power plant; propellant using UDMH and nitric acid; control system actuators fight with swing engines, such as the development does not come out swinging engine one o'clock, to use gas as a transitional rudder; the control system uses dual compensation programs; to increase the reliability of the control system, consider using duplicate circuit; be pressurized with nitrogen after heating; structure of the basic material is aluminum; warhead basic materials using heat-resistant glass, steel, end the use of laminated steel or reinforced glass ceramics; projectile diameter of 2.25 m is recommended. 1966, April-June. The four-parallel engine (codenamed "YF-2") continuously through 106 tons of thrust, the time 140 seconds acceptance test. So far, the engine has entered the delivery status. Engine from pre-study to formally delivered loading, a share of six years (1960-1966 years). Where "YF-2" took two years, conducted a study of 181 ground and delivered hot commissioning, the cumulative time 10,930 seconds. 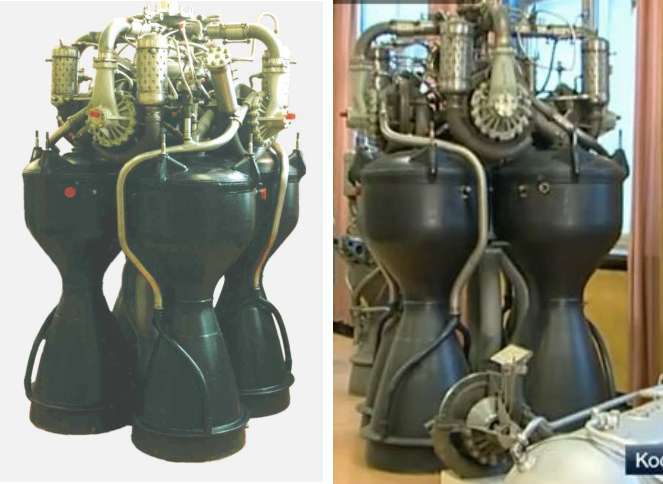 Successfully developed a store propellant engines for improving the performance of the actual use of strategic missiles played an important role, but also lay a good foundation for the development of large technology thrust engines. December 26, 1966, the first flight test. Judging from the situation flight tests in 111.2 seconds before the system is to coordinate the work of the various parameters is normal. 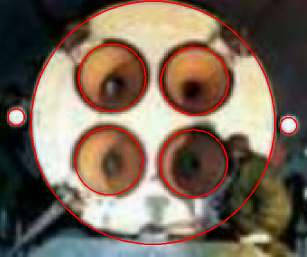 111.2 seconds later, due to engine failure group Ⅱextension, thrust suddenly dropped significantly. 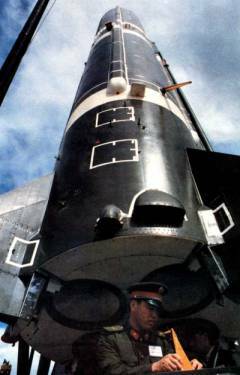 January 12, 1967, the second flight of telemetry missile launch again. 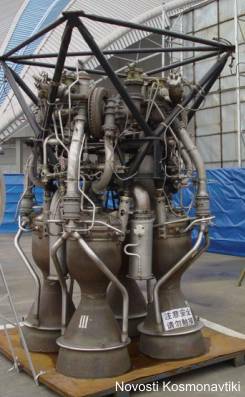 When the missile flight to neighboring engine shutdown (129.2 seconds), the engine groupⅡ extension appeared a significant decline in thrust. 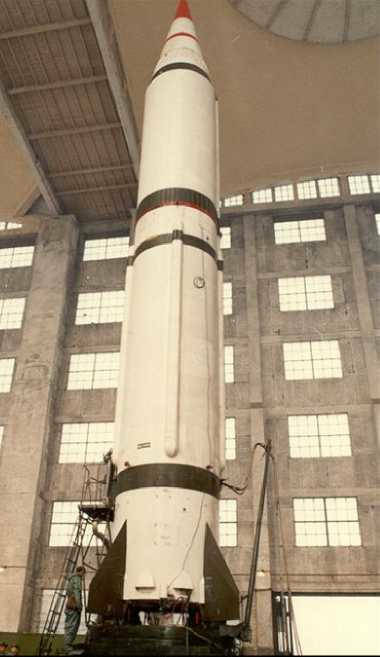 The improved design, May 17, 1967 for the third flight test, because after filling propellant missile force structure, resulting in deformation of the six pipe connectors, appeared not to propellant tank pressurization failure. 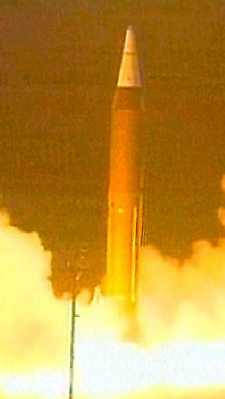 Then on May 26 was successfully launched. 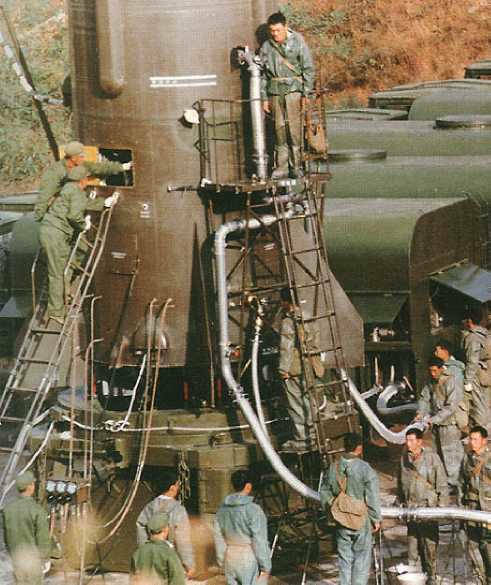 June 10, 1967, DF-3 fourth flight test, the engine groupⅠextension appeared thrust faults decline. To solve the problem of the engine, eleven focused on various aspects of power through data processing, theoretical analysis and simulation experiment, the layers in-depth analysis of the causes of failure. After the improvements, the engine ground after several long-range test inspection work is reliable. Life expectancy increased from 186-195 seconds up to 300-500 seconds. After the previous flight test, engine thrust and then there have been no decline in the phenomenon. 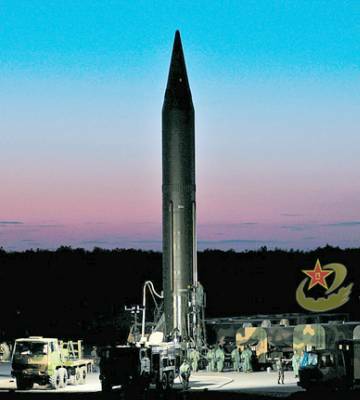 After completion of the flight test, DF-3 that developed into batch 02, and start in the new missile test conducted throughout North flight tests. 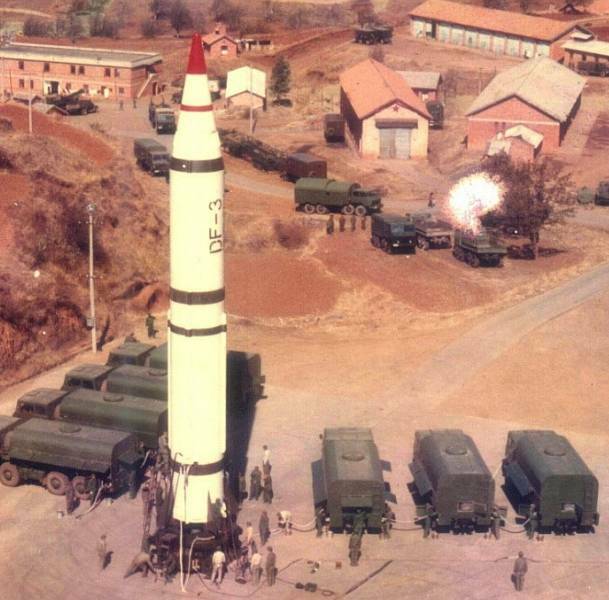 1968 December 18, the first one telemetry missile launch from North missile test base, successfully completed the entire flight test, a range of 2,517.3 kilometers, nearly vertical placement deviation 2.471 km, lateral left 8.789 kilometers. But the reliability problems of the engine has not been fundamentally resolved. 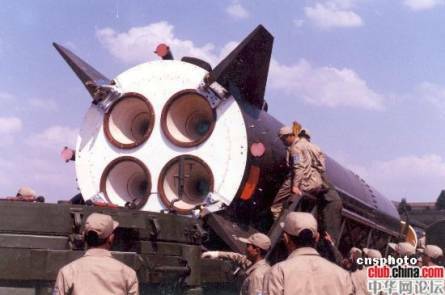 In order to improve engine reliability, in December 1980, the State Council issued a DF-3 missile variant (DF-3A) of the task, and to determine the combined forces fired training flight tests conducted. In 1982, the overall design of a hospital department proposes to develop the mission statement YF-2B engines. It is based on the YF-2 engines on tapping the potential of an improved model, keeping the original system structure unchanged, only the production of certain imperfections and some technical issues left over were adaptations. In order to solve the high-strength aluminum alloy welding burnt problem oxidant stop valve casing machined to shape the overall program; check valve installed backwards to avoid accidents, valves and export respectively left and right hand thread; production process according to the thrust chamber needed to ensure the quality, changing the size or tolerance with local requirements; to solve the problem of leakage of fire, gas generator and turbine bolted connection mode from welding to form. Because of these changes and product batches difference to engine performance brought on by lack of knowledge, resulting in 27 October 1984 and 16 November two flight test missile propellant mixture ratio due to low fuel depletion failed to achieve the desired flight test purposes. 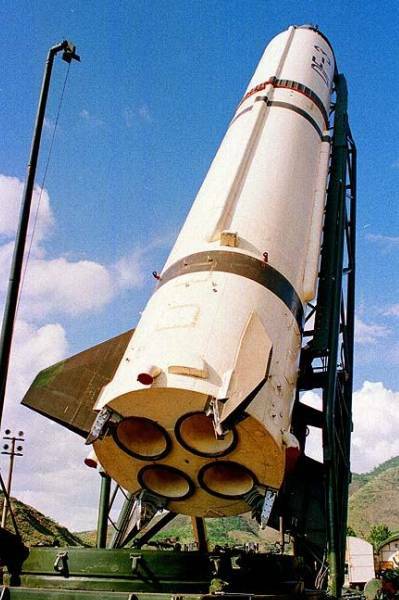 December 27, 1985 and January 13, 1986, improved third, fourth missile flight test a success, stable engine performance, reliable, meet the design requirements. 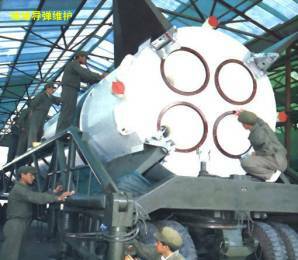 DF-3A larger ground equipment also made to streamline, improve and enhance the mobility of weapons systems. 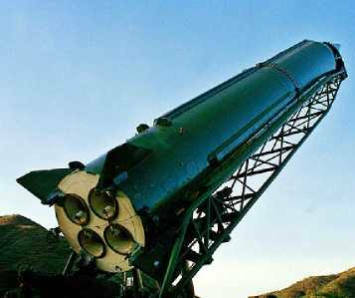 August 1988, the State Council approved the DF-3A missile.